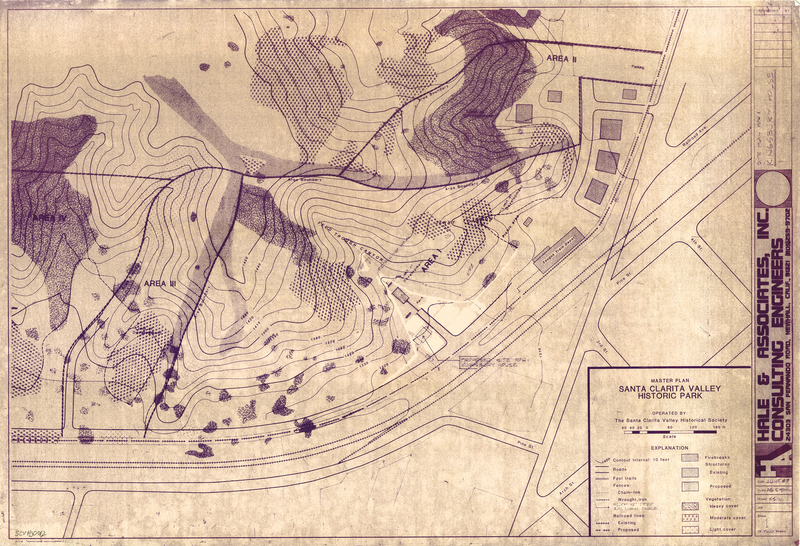 SCVHistory.com HS8703 | Heritage Junction | Blueprint: Kingsburry House Relocation Site Plan, 1987. Site plan for the 1987 relocation of the Kingsburry House from 24318 Walnut Street to the "Quester Court" area of Heritage Junction Historic Park, inside William S. Hart Regional Park in Newhall. Blueprint by Hale & Associates Inc. Consulting Engineers (Don Hale) of Newhall, June 1987. The so-called Kingsburry House was originally built in 1878 and was located at 8th and San Fernando Road. It was occupied by Lyman Stewart in 1883, who later formed the Union Oil Co.
August Ferrier bought the house in 1911, moved the structure to 24318 Walnut Street, and leased it to the Young family. Julia H. Young owned and managed the drug store, and was voted Queen of the first Newhall Rodeo. Ted Kornelissen, a native-born Dutchman who became the local mailman, bought the property from Ferrier. He then sold it to Ruth and Charles Kingsburry in 1943. Charles was a veteran of the Spanish-American War. He helped build the powerhouse in San Francisquito Canyon and operated a meat market in Newhall. "Uncle Charlie," as he was usually called, aided widows and was a coach in the Masonic Order. 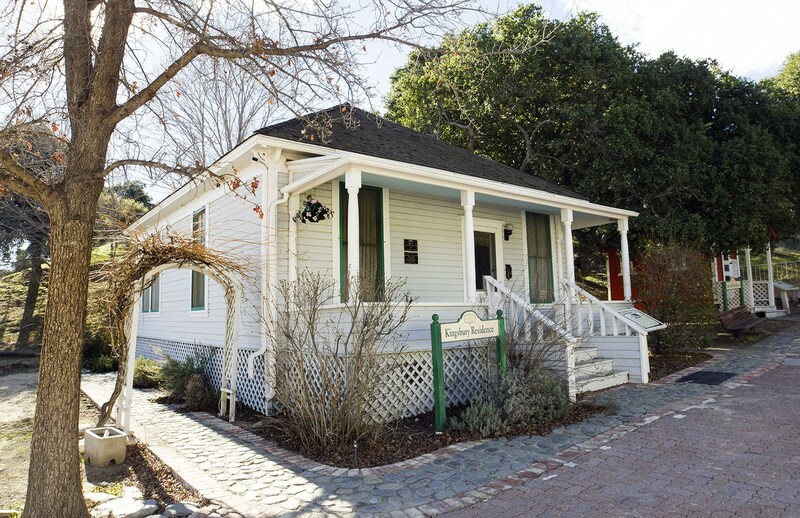 In 1987, the home was purchased by local Realtor Jim Droz and dentist Alan Fine and donated to the Santa Clarita Valley Historical Society. It was moved to its present location in July of 1987. The Kingsburry House is architecturally significant as an outstanding example of colonial-revival style that has not been modified, with the exception of two additions at the rear: one to enclose the kitchen and indoor bathroom, and a second for a service area and additional bedroom. The house originally consisted of a living room, dining area and two bedrooms. Cooking was probably done outside on a back porch. It has a pyramid-shaped roof and shed porch. Restoration and furnishings of the house was completed by the Questers in 1996, and the house is now open on the first Sunday of each month (except holidays) from 1:00 to 4:00 p.m. According to the Santa Clarita Valley Historical Society, Charles H. Kingsburry and his wife, Ruth, bought a home in Newhall in 1943; clearly from this photograph, he was here already. Today the Victorian-style "Kingsburry House" sits at Heritage Junction Historic Park, having been moved there in July 1987. Per the SCVHS: "Charles was a veteran of the Spanish-American War. He helped build the powerhouse in San Francisquito Canyon and operated a meat market in Newhall. 'Uncle Charlie,' as he was usually called, aided widows and was a coach in the Masonic Order." Now, as of June 2012, local historian Pat Saletore appears to have put the issue to rest when she came across a World War I draft card from 1918, singed by Charles in his own hand, as "Charles Henry Kingsburry" with two R's. (He was exempted from service, as he was pushing 40 and had previously served.) Also, in 1957, he was still living at 24318 Walnut Street — the aforementioned Kingsburry House — where he was listed in the local phone book as "C.H. Kingsburry." Saletore's research shows two different dates for his birth: August 18 in some places, August 19 on his WWI registration card, but either way in 1879 in Missouri. He died Aug. 10, 1963, in Los Angeles. HS8703: PDF and 9600 dpi jpegs from original blueprint, Santa Clarita Valley Historical Society files.